But first...what is the future for print? And commentators proclaiming the death of print are legion. So there’s no denying that print’s fortunes have plummeted, just as other media that were overtaken by more convenient technologies have done in the past. But print still has its cheerleaders. There are even those who say print is the new vinyl – drawing a parallel with the niche appeal of a music-distribution technology that was first overtaken by tape (but who still has a tape deck?) and then by CDs (that don’t seem as robust as my old LPs). So it’s probably fair to say that print will have a place in the future of news distribution. We just don’t know how big a place it will continue to earn, or for exactly which markets it will still work. Speaking personally, while I consume about 90 per cent of my news online, and also use the web and mobile versions of print titles I subscribe to, print is still unique. Online, I pick from a wide array of sources – or brands. With print, I’ll consume a great deal from one particular brand. I’ll always want the weekend papers, and I get a richer experience – and more enjoyment – from reading print than I do from electronic platforms. So there are situations in which, for me, print is still the favoured way to consume news, information and entertainment. I may well be in a small minority in valuing a physical newspaper, but serving minorities that value you highly is not a bad business model. Indeed, for newspapers it may be the key to survival. Listen to Clay Shirky. Shirky posted this analysis of what newspapers need to do to serve effectively those still prepared to buy them. He says there that while the median reader, the general interest readers who once formed the mass of newspaper readership, won’t pay for news, there is a small and very loyal core readership that will – as long as their newspaper gives them exactly what they want. And what they want may be highly specialised, and very different from the general mix of news, gossip and entertainment that even ‘serious’ papers have come to rely upon increasingly over the past 20 years or so. So what I think we can conclude from this is that news organisations need to pretty much reinvent their print products if they are to survive. While the focus in newspaper offices has, understandably, been on how to use the new range of online, multimedia and social media opportunities that now present themselves, the other big and unaddressed challenge is to create a new form of newspaper that is finely attuned to the needs of the small core of readers who will continue to pay for it. My hunch is that this will involve the abandonment of the populism that many papers have gone for; the dumbing-down in an effort of satisfying a mass audience. Today the Sunday Times’s circulation is just over 1m, which is down by 7.51 per cent on the previous year. Maybe the key to stemming that decline – or at least to establishing the title at a level where its core readers are happy with it – is to look again at heavy-weight content. But pitch something like the Maugham book today as a promotion and marketing would think you were mad. Elsewhere, there is a growing file of evidence that some audiences – often niche audiences by topic or geography - are best reached via print. Most papers are local papers, and some locals are doing interesting things with print. Some are taking the strategy of engaging with citizen journalists online, and then curating some of the content they produce in highly geo-located print products. This post on the MultiAmerican site - ‘In L.A.’s Boyle Heights, hyperlocal news comes in print’ - talks of a collaboration between the USC Annenberg journalism school and La Opinión, a Spanish language news organisation, to create a printed paper on which the reporters are local high school and other students. 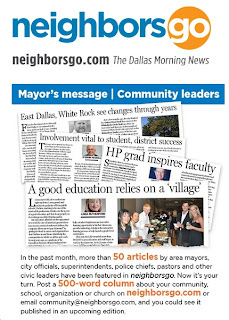 This is the second hyperlocal news site these partners have launched. 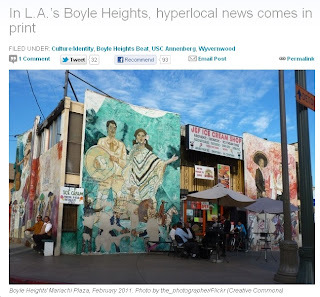 The post concludes: “The community newspaper model, which one might argue is the original hyperlocal news, has been a long-time fixture in Eastside neighborhoods. Many of these are covered by the small Hispanic-owned local papers published by Eastern Group Publications “ which have a circulation of over 104,000 and a readership of nearly 500,000. In the UK, print newspapers for ethnic, immigrant and language groups have sprung up. If you are a registered user of MMJ you’ll find an overview of that phenomenon here and an interview with the editor of a UK-Lithuanian newspaper, Londono Zinios, here. Some newspapers are taking the strategy of engaging with citizen journalists online, and then curating some of that content in highly geo-located print products. The cheerily titled Newspaper Death Watch, which chronicles the decline of print titles, found this piece of encouraging news; “Does print still have value? The people at neighborsgo.com would argue that it does. Those posts are scanned by editors and the best are curated in 11 print editions covering 71 communities which are home-delivered to over 340,000 Dallas Morning News subscribers each Friday. It's not just newspapers that are reinventing their print personas. B2B magazines are working to the same goal. Just as I was writing this, an alert popped up that "The Lawyer magazine has unveiled a radical redesign that will see its weekly print edition devoted entirely to analysis, features and comment." Editor Catrin Griffiths says: “Print works, as long as you get the product right – analytical doesn’t have to mean anodyne. "The big issues of the day are best served analytically and at length - it’s what print does best." So, the challenge for print in general, and for the newspaper industry in particular, is to learn who will pay for a print product, and what they will need to see in it. Meanwhile, maybe you'd like to create your own newspaper?